You are currently browsing the tag archive for the ‘overcoming the past’ tag. I think so many times we think about the capability gap in our lives when it comes to Gods call – big picture wise and in the everyday opportunities. There is that gap between what we can do and what HE can do THROUGH us. When we step out HE steps in! The reality is the only difference between the accepted and the rejected is whether our name is in the book. It’s not by how good we were, how many poor people we fed, or old ladies we helped cross the road, whether we don’t swear, keep to the speed limit, tell the whole truth and nothing but the truth. It’s not about how nice we are or how many times we go to church. The reality is that without Jesus – without His saving us –we deserve that wrath and punishment. We are the bad fish without God’s grace. By nature and by behaviour we are the bad fish. It’s all about what Jesus did on the cross to pay the penalty and judgement we deserve and its all about us being born again – changing citizenship from the world to the kingdom of heaven, changing species from bad fish to good fish. Galatians 6:9 says Let us not become weary in doing good, for at the proper time we will reap a harvest if we do not give up. Peter had a choice to believe Jesus and trust Jesus and obey Jesus and put down the net, even though in reality PETER was the expert fisherman. Fishing was in his blood. Fishing was probably ingrained into the pours of his skin! Who was Jesus? Some random stranger on the shore? A rabbai? How many times have we found ourselves in peters position and NOT responded in obedience the way peter did? Sometimes we ignore it because we’re tired, or busy, or because it was inconvenient or because I didn’t really believe Jesus would work a miracle or because his request made no sense in human terms. Refuel Just as we need food to keep our bodies going, and fuel to keep a fire going, and fuel to keep a car going… we need fuel to keep our spirit going. 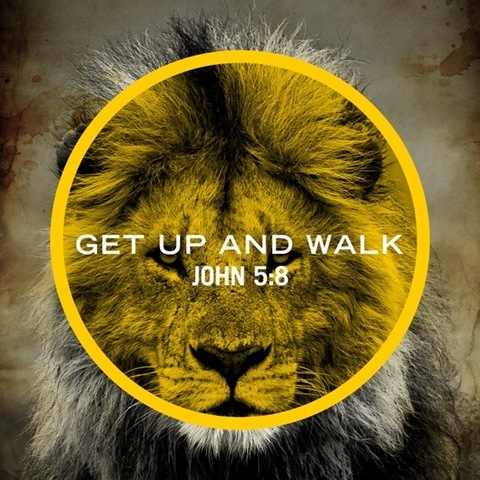 Remain Often in this time of weariness – this time of discouragement – this time of refocusing and refuelling the enemy can pounce on our vunerability and make us want to not only give up but to pull back… to step back or to drop out. Don’t listen to him. REMAIN where you are, continue to press through, continue to do good. Resolve In the midst of the PROCESS between the promise and the fulfilment sometimes you just have to resolve to stand up, to press in and to move forward. No matter how long it takes and not matter how hard it is. God calls us to be fishers of men. To live our lives in such a way that it demonstrates the reality and goodness of God to those around us. So that they too will come to know God and His saving power, that they too will be transformed inside out and become good fish. The gift of salvation is not something we could ever earn, but its not something we should keep secret either. crazy love compels us: The love of Christ leaves us no choice except to live our lives for Him. crazy love constrains us: it’s as important to have a “not gonna do” list as it is to have a “to do” one. I have one good reason why you should walk away from temptation now. One reason. GOD IS BETTER. But because of his great love for us, God, who is rich in mercy, made us alive with Christ even when we were dead in transgressions – it is by grace you have been saved. And God raised us up with Christ and seated us with him in the heavenly realms in Christ Jesus, in order that in the coming ages he might show the incomparable riches of his grace, expressed in his kindness to us in Christ Jesus. For it is by grace you have been saved, through faith – and this is not from yourselves, it is the gift of God – not by works, so that no one can boast. For we are God’s handiwork, created in Christ Jesus to do good works, which God prepared in advance for us to do. Psalm 139 tells me that I am wonderfully and fearfully made, by God, and for God. For a purpose. He intricately wove my frame, my external physical body was created and wired by God in respect that God knew how He was going to use my days. I am formed for a purpose. God has a mission for our lives and we are created on purpose. The reality is if we do not overcome the past it will determine our destiny. If we don’t effectively and completely deal with our history our destiny will be dictated by events in our past. In the beginning God made all the amazing things in our world. He made the whole world. He made all the stars and the moon and the sky and the sea and the fish and the animals and the people. In Evangeline’s adventure bible it says at the end of the story of creation that God’s world and everything that lived in it was ready now… ready for the adventure to begin. The bible says that God loves you and made you for a special reason. He made you and knows all about you. He knows what your favourite tv show is and what time you go to sleep at night. He knows what your favourite ice cream flavour is and He knows what can make you scared. He knows everything. God knows how many hairs you have on your head and how many hairs you have on your toes! The first time I met pastor peter was not at The River but at a conference by my church in Dunedin. When I got saved I was heading down a particular path and my life was very different from what it is now. In fact I LOOKED very different from how I do now. Tony always asks me if there is photographic evidence of that era of my life… alas and alak… no. I owned one pair of shoes. Doc boots to be precise. i wore them to uni, to church, out shopping, to the beach and as a bridesmaid. Shaved my hair to a number 2 when I went to uni. I morphed from grunge to semi goth to op shop alternative chick. In fact when I was introduced to peter when I started at the river he was SHOCKED that I was THAT chick that he had met in Dunedin. My life was very different. My life was headed down a path until I made a change. What is the story of your life that you want to be telling in 2 years, 5 years, 25 years? What is the destination and destiny that you want to be living? To get there we have to be walking on the right path, and I believe that one of the greatest obstacles we have moving forward is to overcome is our past. History is filled with people who overcame great odds and then went on to change the world for Jesus, who went on and did great exploits with God. And Paul. Who was Saul. Paul had quite a history. In fact he kind of has two pasts. There is Saul the Pharisee, born into the right family, the right economic conditions, wears the right clothes, says the right things, knows the right people. And there is Saul with rap sheet and a half. It’s Saul we find calmly stands by while a man is stoned and is involved in other persecutions and imprisoning of Christians. And by imprisoning I don’t mean a gray walled 3 meals a day modern respect your human rights type prison, I mean they beat you, throw you in a hole, torture you, violate every right type prison. This is Paul’s resume. I forget the past, I forget what is behind, and I strain and press on facing forward towards the goal and prize that God has for me. Now when Paul is saying FORGET he’s not saying lets obliterate our memories, let’s just wipe the slate blank – because over and over again in the bible God commands his people to remember, to build altars of remembrance. What Paul is saying is that we should be focused on moving forward and drawing nearer to God, nothing holding us back, throwing off every entanglement and everything that hinders us. That we deal with the past appropriately and completely. If there are things we need forgiveness for, ask for it. If there are things we need to forgive, forgive. If there are things we need to talk through, find someone to open up to. Ask for God’s perspective on your past. Remember His promise, the works out ALL things for the good of those who love Him and are called. That might be a dark past. Something you did. Something that happened to you. Regrets. Pain. Failures. Things that paralyze us, or make us feel unworthy to follow God or do anything significant for Him. Why would God use us… look how messed up and broken I am? Look at what I did, how royally I stuffed it up? Even in the midst of your mess, God loves you. He died a death on the cross so you could be forgiven of your sin and start a new life in Him. 2 Corinthians 5:17 says, if anyone is in Christ, he is a new creation; old things have passed away; behold, all things have become new. Seriously some of us have been blest to grow up in a Christian family and have walked with God as long as they can remember. I myself celebrated my 19th Christian “birthday” on Tuesday. But we still have to completely trust in the grace and salvation of Jesus because even our goodest works and best intentions fall short of the glory of God, even our best isn’t good enough. Our victories can be beautiful things – times when God has come through for us and done great things – but they can make us complacent and self righteous. They can be a hindrance instead of a propellant. He has made a choice to forget – and the tense is a present tense – forgetting – he is continually making choices to continually forget, to leave behind, conscious refusals to let his history absorb his attention and impede his progress. He counted all the good things, his good heritage, his good upbringing, his education, his connections, his accolades as rubbish, as trash, as nothing compared to the greatness of knowing Jesus. Paul had his eyes on the prize. The phrase PRESS ON is translated from the greek word Dioko and it speaks of an intensity of effort leading to a pursue with earnestness and diligence with a goal in mind. It gives us the picture of going on the track of something like the hounds on the hunt and pursuing after the fox and implying a continuing effort to overtake, reach, or attain the goal or the determination that an Olympic runner might have in pursuing the gold medal. Paul uses this language over and over again, that we are to strive and stretch forward, that it is an intentional focus of direction, that we are taking conscious steps to live our lives with an aim and a goal, not just breathing but intentional. What does straining forward look like? What does it look like in real life to press on? For me – its intentional time in worship, prayer and reading His Word – which is not new information for anyone here I am sure. It’s about walking with God and filling my mind and heart with fired up preaching and books. It’s about being with people who challenge me to grow closer to Jesus and having conversations that give me heart burn in a good way. It’s about living my life in a position to say YES always to God, to obey the nudge of the Holy Spirit. It’s not a system of rules and box checking but it is a lifestyle of living fired up and evidenced in the things I really do, not the intentions I have. What is the goal, the prize – some flavours say THE UPWARD CALL? What was he straining for, pressing on for? Paul isn’t straining forwards for the kiwi dream, the white picket fence, 2 point 5 kids and an allergy friendly spca rescued dog… he isn’t driven by ambition, reputation, or even trying to live a good comfortable moral decent life. He is on a totally new path. Paul overcame his past by changing the direction he lived his life in. He stopped looking back, at the regrets and also the self effort – and he faced forward with his eyes fixed firmly on Jesus Christ and His purposes and plans. This is how we too overcome. We face forward into the forgiveness and faithfulness of God and the destiny that He has planned for us. Paul could have been devastated by his history as a persecutor and murderer – but instead he allowed God to use that as testimony of the great faithfulness and gracefulness of God and he pressed forward into his destiny and became one of the most pivotal Christians of all time. If we are in Christ then our HISTORY does not establish our IDENTITY nor does it determine our DESTINY! Do you know what your goal and prize is? Do you know what your upward call is? Are you passionately pursuing it? Are you facing the right direction and straining forwards to achieve the goal? Joyce Meyer, who speaks to millions of people around the world each week overcame a history of sexual abuse and depression to move forward into her destiny. And then there’s me again. On Friday night my kids went to the “date night” at childrens chuch – while tony and I went out on a date. The kids watched mr poppas penquins and dressed up in p things – caleb was piri weepu and Evangeline, a princess, and we caught the end of the movie with them. There are a lot of p words in mr poppas penquins. So much so that my thoughts were then punctuated with a plethora of ps as I sat down to try and finish my preaching presentation. I was thinking about what positioned me on a new path, a path that looked and looks radically different from where I was 15 years ago. I can pinpoint a defining moment at one camp where I spent a long time on the floor before God and He totally did a total heart surgery on my life. I got up different. I’m not saying it was a flick your fingers and it was done moment – it took – it takes a lifetime of CHOOSING to forget and CHOOSING to face forward and fix my eyes upon Jesus. But it was a good start – to get myself before God and lay it out there that I didn’t want to live held back by the past, to ask for forgiveness and then to actually embrace it. I think I got up from that encounter with God and “all of a sudden” realized that my identity and destiny did not need to be determined by my past, and that though I was human and flawed and broken, for that very reason Jesus came and lived and died and paid the price that I could never pay. 2 corinthians 4:7 But we have this treasure in jars of clay to show that this all- surpassing power is from God and not from us. My life is a demonstration of His love and grace. Jesus set me free and changed me. He empowered me to stop looking behind but to look ahead to the future and the plans that He had for me and to look ahead to HIMSELF, the great prize. I choose not to look back or be impeded by mistakes I have made. I choose to look forward and be motivated by the greatness of God and the faithfulness of His promises. Jesus has laid hold of me and made me His own, and so I lay hold of Him and this is what my life is about – to know Him and make Him known. I’m on a journey and the past is the past and shapes me, but I am more shaped by the promises of the future in Jesus. My life sometimes still feels broken and dirty and non mirror like – but I know that God has begun something and will complete it. That’s His promise. We are all on a journey. God has a personal tailor made plan for your life. God has purposed good works and great exploits for us to do. It might take you getting up every day and making a choice to believe that you’re forgiven and set free. It might take exchanging the guilty feelings for a particular verse of God’s truth every time you start to feel them. It might take an aggressive decision to forget the past and press on into the future. Your history may feel like you are staring down a ginormous giant, like goliath. Jesus is the David in the story. He is the one the can and will and has knocked that giant down and overcome and won the victory. Jesus died on the cross to give you a new start, a fresh beginning, a new identity as a son or daughter of God, forgiven, cleansed, set free, chosen, accepted and righteous. The cross is the definitive answer to our sin and our past. The cross declares NOT GUILTY over our lives. It proclaims we are FORGIVEN AND ACCPETED AND RIGHTEOUS in the sight of God. Today can be a day of new beginnings, letting go of the things behind, making a conscious choice to surrender those dark things and those good things into the hands of God, and to face forward, to strain forwards, to press on, to relentlessly pursue intimacy with Jesus, to live our lives racing for the prize. Which direction are we living our life in? Are we allowing the things of the past, both the good and the bad, to hold us back? Have we accepted that we are forgiven? Have we let go of the pain and let God heal us? 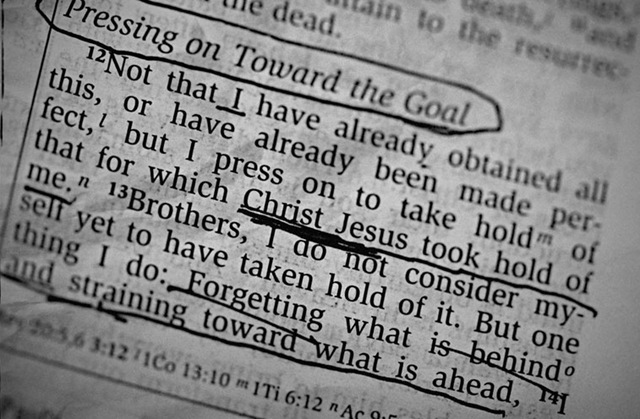 And are we straining forward into the things God has planned for us? Are we pressing on for the prize – intimacy with Jesus? This is your moment. This is your NOW. how do you overcome the past? how do you get past the past and move forward into the future?